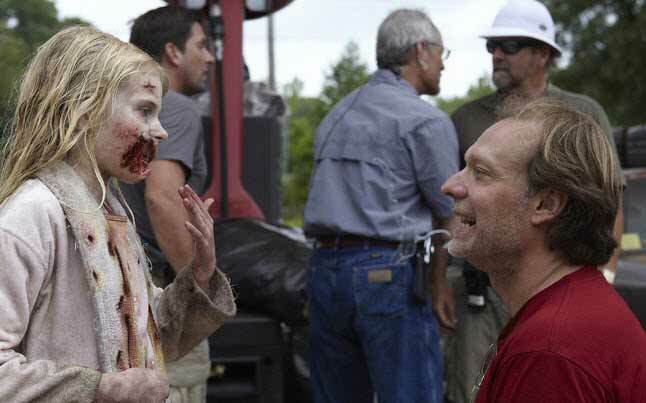 Greg Nicotero who is the well known zombie expert, and Emmy winning special effects artist, has received a promotion by AMC with his role in The Walking Dead. Nicotero will now be known as a co-executive producer and join the ranks of Robert Kirkman and Gale Ann Hurd. Kirkman is known for the comic book series that is the base for the television show while Gale is known for her roles in both “Aliens” and “Terminator”. Greg who just recently won an Emmy for his role thus far in The Walking Dead, will now have some extra and added perks. Nicotero will now be directing at least one episode of the second season as well as direct a web series that is based on the hit zombie series. The web series, or webisodes, will be released October 3rd and tells the origin story of “Bicycle Girl,” the infamous “walker” from Season 1, as she struggles to survive and protect her family as the world begins to fall apart. AMC senior vice president Joel Stillerman said the following about Greg Nicotero. Greg Nicotero has been doing make-up and special effects for over 25 years and this expanded role will only serve the series.